When I first saw Donna Hay doing these skewers I drooled, literally! 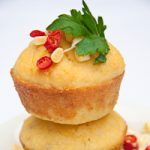 For those of you who don’t know, Donna Hay is one of the most fantastic cookbook authors and food stylists of our time. This Australian has written 14 cookbooks which have sold more than 3 million copies worldwide. I’ve always loved her work but after seeing her on Masterchef Australia, I fell even deeper in love with her inventiveness and warmth. Her recipes are so innovative but yet still so accessible. Donna’s version of this included preserved lemon but because I couldn’t find any and I definitely couldn’t be bothered making my own, I tweaked the recipe to suit me better. It’s definitely worth trying boneless chicken thighs for this. You could get away with using chicken breasts but I find them a bit dry most of the time and I love the meatiness of chicken thighs. Also, try to get the best Haloumi you can afford. Cheaper varieties are often way too salty and very rubbery. It should just be squeaky enough without tasting like you’re eating an eraser from the 80’s. I served my skewers with some Lebanese flat bread I found at my local supermarket but you could use tortillas or even naan for this. And you have to, HAVE TO, serve this with garlicky Tzatziki and cucumber ribbons. There is nothing better suited to these skewers than the cool and fresh taste of cucumber and yoghurt. YUM!! Combine all the marinade ingredients and marinade the chicken for 20 minutes. In a large frying pan, fry the chicken in a tiny bit of oil until golden and cooked through. You can also grill them if preferred. Set aside. Brush the haloumi chunks with some olive oil and heat a griddle pan until very hot. Grill the haloumi until softened but still firm. 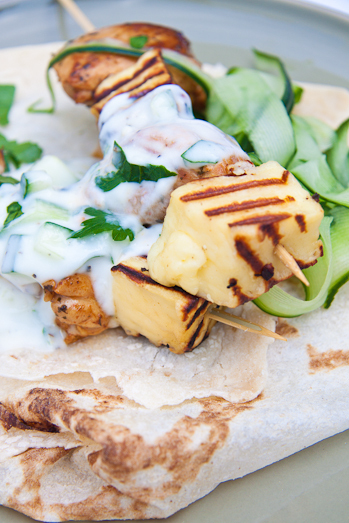 Skewer the haloumi with the chicken. 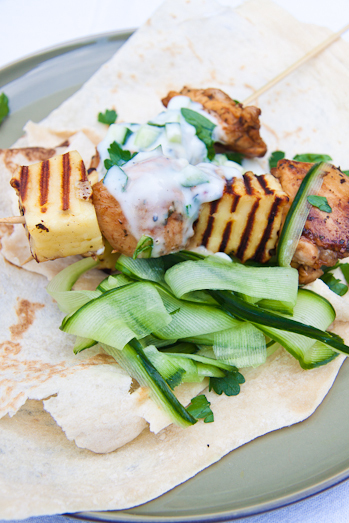 Mix all the tzatziki ingredients and serve with the skewers, flatbreads and cucumber ribbons. I love the haloumi in this. It looks like a great combination. I’m a great fan of Halloumi, even if lots of people think it’s to salty, I like to serve it with barbecues and salad ! These skewers are appetizing. I don’t say it too often in case somebody gets offended, but Donna Hay is my favourite thing about living in Australia! Wonderful recipe. I’ve tried it once. But I love the new twist you created for this dish!